1. Place the gin, lemon juice, grenadine syrup and egg white into a cocktail shaker and dry shake (without ice) to emulsify. 2. Fill the shaker half full with ice and shake again, until the shaker is cold to the touch. 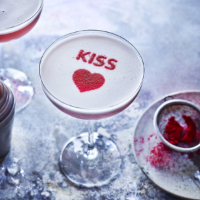 Strain into a cocktail glass, then sprinkle over a little raspberry dust using the Valentines stencil, if wished, to finish. This recipe was first published in October 2018.